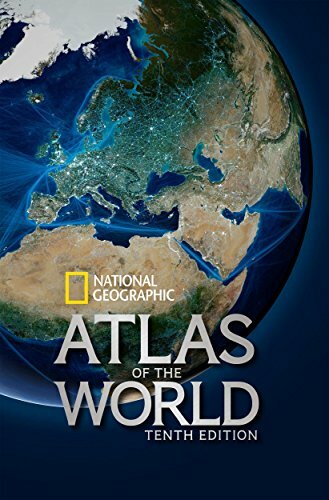 1426213549 -Marking the 100th anniversary of National Geographic cartography, this prestigious reference is the essential guide to understanding today’s interconnected world. Illustrated maps and informational graphics chart rapidly changing global themes such as population trends, urbanization, health and longevity, human migration, climate change, communications, and the world economy. The core of any atlas is the reference mapping section and the 10th Edition boasts the largest and most comprehensive collection of political maps ever published by National Geographic. Completely updated and expanded by sixteen pages, this section features new maps of Ireland, Scotland, England and Wales, three detailed regional maps of Australia, expanded coverage of Africa, and a map of the strategically important area around the Mediterranean Sea, encompassing North Africa and Southern Europe. In addition, special sections are dedicated to the Oceans, Space, and Flags and Facts. These are followed by an expanded index, with more than 150,000 place names. The 10th Edition’s high-quality construction and large format make it a centerpiece to gather around as well as the perfect reference tool for understanding how the present and past continually collide in today’s fast-paced world.